This article will discuss the four levels of behaviour or activities that can be used to measure our effectiveness. To be successful in this world and the next, we have to be ‘doing the right things’ — effectiveness — before ‘doing things right’ — efficiency. You can say you have been busy, but have you been busy just for the sake of being busy; or have you been busy being productive and effective? By being aware of these four levels, you can easily gauge the level of your effectiveness and productivity, In sha Allah. [Qur’an: Chapter 90, Verses 10-12]. A tafsir (exegesis) of the above verses indicates that the easy way is easy at the start, but will be hard later on and there will be consequences. The hard way is hard initially, but the ultimate ending will be good and easy. The hard way involves working for what is beneficial in this world and the next, and continuing to strive for goals and ambitions that may not always feel good or easy. Level 1 activities or behaviours make you feel good (pleasure) and are good for you, good for others and good for the greater good (benefit). A Level 1 behaviour is an activity or a skill that we have already mastered. As such, it is within our comfort zone, we feel good doing it and it benefits us. For example, reciting a surah that you have already memorised is a Level 1 activity. Likewise, once exercising or running becomes a habit, we will enjoy doing it because we are aware of how it benefits our body and health. Level 2 activities or behaviours are those that require extra effort and investment from you, but they are good for you, good for others and good for the greater good. Working toward memorising a new surah from the Qur’an is an example. Another level 2 activity is exercising. Most people do not like exercising or eating healthy because they do not want to endure the physical discomfort of exercise, or the ‘trouble’ that one has to go through to prepare a healthy menu. But these activities are good for you: If you are healthy, you can dedicate more of your energy and activities for the sake of Allah and serving His creation. If you enjoy healthy food, it benefits your family and community too. Indulging in Level 3 behaviours or activities makes you feel good, but they do not really benefit you or other people, and do not bring greater good. Excess consumption: This can be with regards to eating or any other activity. Level 4 behaviours or activities are those that do not make you feel good when you indulge in them. In addition, they are not good for you, not good for others and not good for the greater good. This begets the question: Why does one even indulge in Level 4 behaviours? The reason is what psychologists refer to as ‘self-sabotage’, or a conflict between one’s goals and self-image or beliefs (we’ll cover it in our next article, In sha Allah). If you continue to engage in them, they will have serious negative consequences on your soul. This relates to the concept of comfort zone that we discussed in our previous article on fear. Every moment is a moment of decision: To step up and do what is beneficial but uncomfortable, or to step back and stay safe and comfortable. Alternatively, it may be a decision to step back and away from what is harmful. You can imagine Levels 1 and 2 to be ‘above the line’, literally, and Levels 3 and 4 to be ‘below the line’. Above the line means that you are proactively doing things that are beneficial for you (See Part 1 of the series). Below-the-line activities are those that do not have real benefit for you, your loved ones or your community. Indulging in distractions and procrastination are below-the-line behaviours that will keep you below the line and mediocre. A very important point to note here is: If you keep up with your Level 2 behaviours or practices, they will soon become Level 1. Likewise, if you keep up with your Level 3 behaviours, they will soon become Level 4. So, one is an upward spiral, while the other is a downward spiral. Level 2 correlates to the third stage (conscious competence) that involves implementation via constant and consistent practice. 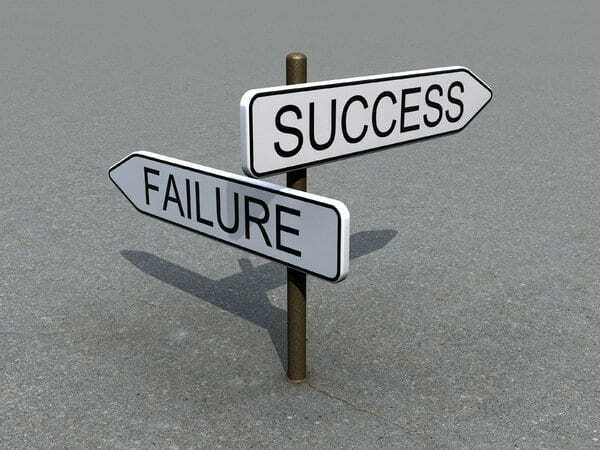 The secret to being effective and successful is to strive to do as many Level 2 behaviours as possible and upgrade them to Level 1, while minimising Level 3 behaviours with the aim of stopping them altogether. Do not even go near Level 4. 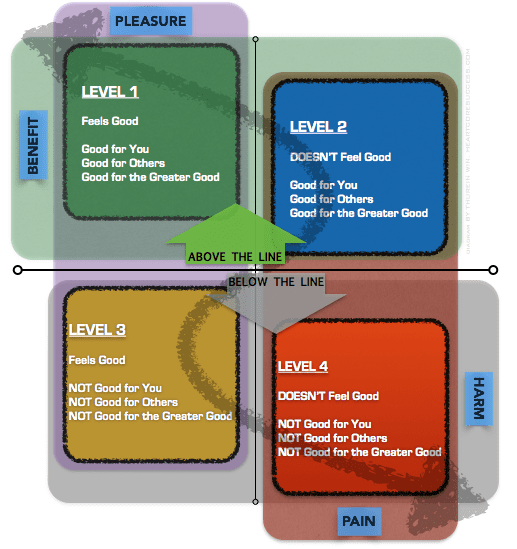 Stay above the line; restrict yourself to Levels 1 and 2. So, what is a practical approach to doing that? The understanding and application of the 80/20 principle will help you stay and play ‘above the line’, In sha Allah. The Pareto Principle is known as the 80/20 principle. In almost anything, 80% of the result is produced by 20% of the effort. If you look inside your wardrobe, you wear 20% of the clothes 80% of the time. In a company, 20% of the employees do 80% of the work. If you are a student, 80% of your exam comes from 20% of your course content. Even some Islamic institutions offer their Arabic and Islamic study programmes based on the 80/20 principle. Similarly, it might be safe to assume that in any event or gathering, 20% of the people eat 80% of the food! So, what is the 20% in your life that will make 80% of the difference? What is the 20% that you should focus on to get a return of 80%? To be successful, you should be spending 80% of your time on the 20% of behaviours or activities that are in Level 2. It is important that we take advantage of this time by doing what we deem as the most important for our growth and success in this world and the next. Nobody Said It was Easy, But It’s Worth It! People say that staying ‘above the line’ is hard. Of course it is hard! That is the whole point. If it was easy, everyone would be doing it. Then what is the point of the test? We will be asked about how we spent the time we had in this world. So, we need to be conscious about our actions and behaviours. We should always check our intentions and ask ourselves: Where is my current action taking me? Which level am I playing at? What kind of behavior is this? The key to making this work in the long term is to strive and be patient. Make incremental progress; nothing worth achieving comes overnight. The key is to keep stepping up and doing what is unpleasant but beneficial, until it becomes pleasurable and habitual. That is why building good habits and rituals is important. If you look at the fundamental and core practices of our faith, all of them have been ritualised, regimented and made obligatory (fardh) upon us. The five daily prayers are fardh. On the Day of Resurrection, all good deeds will be overlooked until our obligatory prayers have been checked. Only if our prayers are in order, will everything else be okay too. In other words, performing our five daily prayers is the prerequisite for making our other deeds count. They are the first act that we will be held accountable for. Second, fasting is fardh during Ramadan. We all know how much we benefit spiritually, emotionally, intellectually and physically by fasting in Ramadan. It is a compulsory spiritual and personal development boot camp that every believer has to attend every year. We come out stronger, leaner (if you do it right) and fitter — spiritually and physically — every single time. Our Creator wants us to live above the line and engage in what is beneficial, even if it is uncomfortable. These are signs for us to ponder over and apply in our life. We can see why it is important to develop discipline and rituals around the things that are not necessarily easy to undertake, but that will benefit us. Ask yourself: What are the 20% of your tasks that if I do them daily, will take my life to the next level, spiritually, emotionally, intellectually and physically? You can do this by starting with your goals. Read this article on goal-setting to learn how to set your goals and how to achieve them. Next, you need to decide who you need to ‘be’ to ‘do’ what you need to ‘have’ those goals. It is your ‘being’ — someone who is decisive, committed, courageous, focused, sincere, present, inspiring, engaging, energetic, grateful — and your ‘doing’ — daily actions, practices, behaviours, implementations — that will ensure your growth and success. So, decide who you need to be and what you need to do; it is around those two factors that you develop and build your rituals and habits. For example, to become someone who is always grateful and living the present, I could set aside and commit to daily reflection or ‘meditation*’ and journalising sessions (5 minutes in the morning and 5 minutes before bedtime) and make them a part of my daily rituals. This is part of my 20% because I realise the importance of gratitude. *Practising being present in the moment and being grateful for who I am and where I am right at this moment. Nourish yourself spiritually by establishing and nurturing your connection with your Creator. Perform the obligatory prayers. Decide on one extra act of worship (nafila) that you can undertake consistently, e.g. duha prayer. Start small and be consistent. Nourish yourself emotionally by thinking about and visualising the blessings that make you feel grateful and goals and visions that inspire you. Think about the people you love and who love you; make dua for them and for your brothers and sisters who are suffering around the world. Nourish yourself mentally and intellectually by reading what benefits you and helps you grow. Set aside an hour, or even 15 minutes, to read or listen to something empowering and inspiring. Read**, review and visualise your goals and make dua. Let your goals empower you. Nourish and energise yourself physically by doing some form of exercise that will increase your heart rate and by eating a healthy and nutritious breakfast (if you are not fasting). **Writing your goals down on paper and reading them everyday helps you remember what is important and is of priority. Otherwise, ‘out of sight, out of mind’. If you do all of these activities and make them your ritual, imagine the person you will become, how you will feel, and what you will accomplish over the next few months! In sha Allah, you will be setting yourself up for success in this world and the next! Print out a blank 30-day calendar and use it to track the habits or rituals that you are building. The best thing to do is work with a coach or join an accountability group programme where you will be held accountable for your daily commitments. The next best thing is to work with an accountability buddy. StickK.com is another great tool to help you stick to your commitments. Remember that it takes discipline, willpower and everything that you have got to make this work. Once you taste the fruits of these beautiful trees that you have planted, you will never go back to your previous lifestyle, In sha Allah. “And whoever has taqwa (consciousness) of Allah – He will make for him a way out. And will provide for him from where he does not expect…” (Qur’an, Chapter 65, Verses 2-3). We need to remember and be conscious of Allah and constantly check our intentions. We should also be conscious of our actions and be present in the moment because we need ‘awareness’ and ‘consciousness’ to change, and change can only happen in the present moment. The assessment of the Four Levels of Behaviours will now enable you, I hope, to gauge and maximise your productivity and effectiveness. You also now know that to live at Levels 1 and 2, you need to have goals and rituals for different aspects of your life. In sha Allah, in the next article, we will learn about some common behaviour patterns that we can follow to prevent ourselves from living ‘below the line’ and thereby achieve effectiveness and success. More specifically, we will address self-sabotage: What it is, why we do it and how to subvert it. I would love to know how this article has benefited you and how you plan to apply its concepts in your own life and make them a reality! Please share your thoughts, feedback and comments below!